Australie (offeecially kent as the Commonweel o Australie) is a federation o sax states, thegither wi ten federal territories. ↑ 1.0 1.1 1.2 1.3 1.4 The national Banner o Australie is uised in territories which hae na banner o thair awn. ↑ Under the definitions in ISO 3166-1, the AAT is covered by the Antarctican ISO 3166-1 alpha-2 code "AQ". ↑ No permanent population, research station with fluctuating staff numbers. ↑ Unless providit, references an details on data providit in the table can be foond within the individual state an territory airticles. ↑ "3101.0 – Australian Demographic Statistics, Mar 2016". Australian Bureau of Statistics. 22 September 2016. Retrieved 1 November 2016. 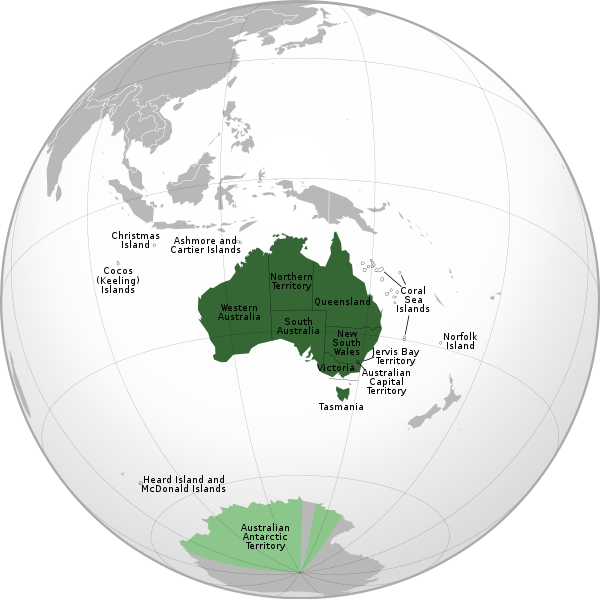 ↑ "Area of Australia - States and Territories". Geoscience Australia: National Location Information. Geoscience Australia. Retrieved 2 November 2016. ↑ The auld caipital o Wastren Australie wis technically Broome, awtho it wis niver quite defined as such. Perth wis eventually defined as the caipital bi statute in 2016: City of Perth Act 2016 (WA) in AustLII. This page wis last eeditit on 21 Apryle 2019, at 08:24.